But not just any essential oil diffuser necklace will do the job well. You’ve (hopefully) done your due diligence and purchased high-quality essential oils. Now you want to optimize the diffusing power of every single precious drop! Here’s how. Diffuse them with a kiln-fired, professionally made essential oil diffuser necklace; a Terra Cotta Pendant. The “kiln firing” step is very important. 1) It evaporates all the water from the clay leaving a multitude of tiny air pockets throughout the piece which gives it the capacity to diffuse for 1-3 days. 2) It burns off any organic material that is naturally occurring in the clay leaving a pristine piece. 3) It makes the clay hard as a rock (durable) but light as air (comfortable to wear). 4) It transforms muddy brown clay into a beautiful, rich, terra cotta colour. The beauty of a Terra Cotta Pendant is that it goes with everything you wear! If you have another pendant, you like to wear you can double up or tuck your Terra Cotta Pendant into your shirt, and it will still diffuse into your personal breathing space wherever you go. Terra Cotta Pendants are earthy (yes, pun intended), made with chemical-free natural clay with nothing added. Terra Cotta Pendants are professionally made yet lovingly crafted by hand. Every. Single. One. 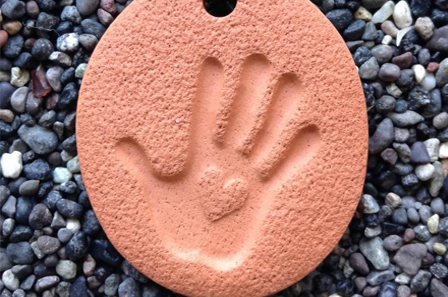 We’ve been making Terra Cotta Pendants since 2003 and believe me, you learn a lot in all that time. Back then we recognized a need in the marketplace for an affordable essential oil diffuser necklace and went to work on it as a family. We wanted to provide an effective yet affordable way for people to diffuse essential oils. And, yes, we sell at Wholesale prices for the Independent Distributor of essential oils or the essential oil enthusiast. Our price break is just 30 pieces. See the Wholesale link for details. If you have an online or brick and mortar essential oil store, make these essential oil diffuser necklaces available for purchase by your clientele. It’s the perfect way for you to help them get the most out of the essential oils they buy from you! Browse through over 89 different designs!